This week feels like it’s flown by…and when did it become February?!? I’m still struggling to remember it’s 2014 when I write the date and now we’re already into the second month. Crazy. To kick off the weekend, check out my favourite finds from the web this week. DIY Hairdo I’d Love to Try: I love this look with a braid down the side, a messy bun at the back and face framing pieces. If I try to attempt a messy bun it usually comes out all wonky, but if I just go to toss my hair up while I’m working late at night, I’ll catch my glimpse in the mirror and it’ll look perfect – and no one is around to see it. 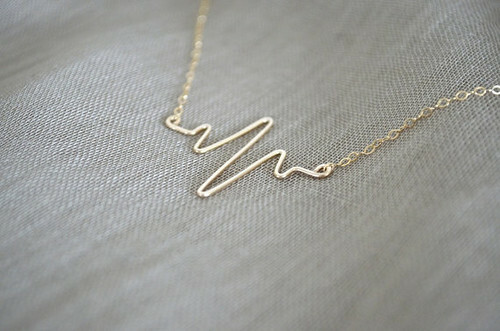 Favourite Etsy Find: Maybe it’s because Valentine’s Day is coming up next week, but I’m loving this Heartbeat Necklace. It’s simple yet quirky at the same time. And wouldn’t it be great to make said breakfast in here: After months of hibernating, I love the idea of cooking up a storm in a big bright, white kitchen with big windows, colourful flowers and lots of natural light! Someday, my friends, someday. Where I wish I was right now: Sand, sun and warmth. Oh to be warm again. Best Valentine’s Day Treat: Cupid’s Arrow Cupcakes – how cute! Weekend Craft: This Arm Knit Scarf says that it takes only 30 minutes to make! I bet it would still take me an hour or so, but that still sounds great. I totally dig how the one in this picture has the wooden button. It’s such a fun little detail to add. 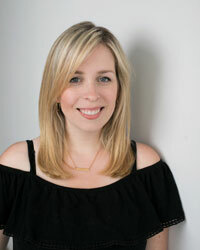 Get Movin’: I love the whole concept behind Lazy Girl Fitness – there are little things that we can fit in every day that will contribute to our health and well being. I never thought about all the body weight moves you can do while reading, cooking or even brushing your teeth. Favourite simple attitude adjustment: On weeks like this where I’m fighting the onset of a cold, struggling to keep up with my to-do list and battling all the bad weather, it’s so easy to fall into a cycle of using negative words like many of those I see on this list above. Dude, I really need an attitude adjustment right now. I know that when I use negative words, it affects my attitude negatively too. Seeing a chart like this reminded me to be mindful of the words that I use and how those affect my own attitude and those around me. It’s a simple adjustment, but I think it can make a big difference to how you feel. I’m printing this out for my daybook this next week as a reminder. And on that note…I’m signing off for the weekend. We’ve got a date night (woohoo!) to see Labor Day. I heard great things about it after it played at the Toronto International Film Festival this fall and I’m looking forward to it. It’ll be a nice way to end the week and spend some time with Garrett (and eat popcorn!) before all the weekend plans start. Hope you all have a fantastic weekend! I looove that scarf! Looks so cozy! And I love your dog scarf too from your previous post! Adorable! Love the “Negative swap to Positive” chart! I’m going to print that out for myself. Keep up the amazing work! Love your ideas and inspiration. I always love getting lost in a blog, just looking at old posts. If you have your own or some good ones to recommend, send them my way! I LOVE this scarf. But when I went to simplymaggie, her scarf doesn’t have the little cuff with button detail. How is that made? It doesn’t look arm knit. I don’t think the loop that the button is on was arm knit, but the main part is. You could knit a small rectangle and then attach the ends together to make the loop. I’d sew the button right on top of the loop. I’ve never had a chance to make this scarf yet, but it does look like it’s doubled up from the photos. I made about 20 arm scarves last year as Christmas gifts and I am preparing to make a few more this year. I have found 7 or 8 stitches wide and 13 or 15 stitches long make for a great size. And, yes, they are doubled when worn. These are great fun to make! Enjoy! Where do I find the pattern for this scarf? This looks like a very worthwhile blog and I’d like to be a part of it.